My family is big on tacos. Seriously!! Even my picky little eaters gobble them down like candy. It's probably the only food that I know they will eat time and time again. But as much as I love taco night, the best part is mixing the leftovers with Fritos and having some good ol' Frito pie for lunch the next day. 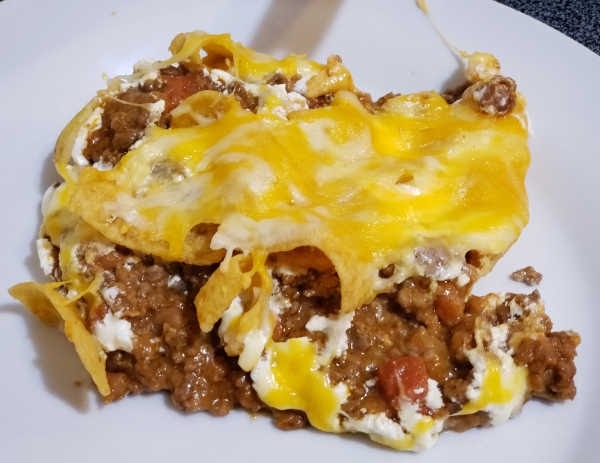 This Frito pie recipe is AMAZING and the best part is that you don't have to wait to have leftovers to make it! This dish is sloppy and it's not a very pretty so taking good pictures was a little difficult. Despite it's looks, it is DELICIOUS!! 1 cup of shredded cheese. In a large skillet, brown meat. Once it's brown drain the grease. 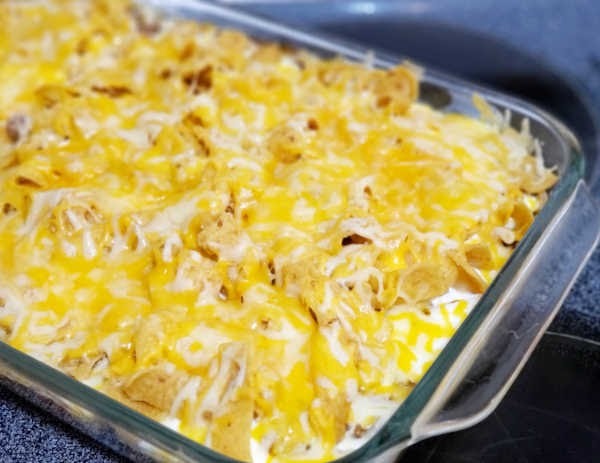 Place half the bag of Fritos in the bottom of baking pan. Spread your meat mixture over the Fritos then popped it in the oven at 350* for 20 minutes. 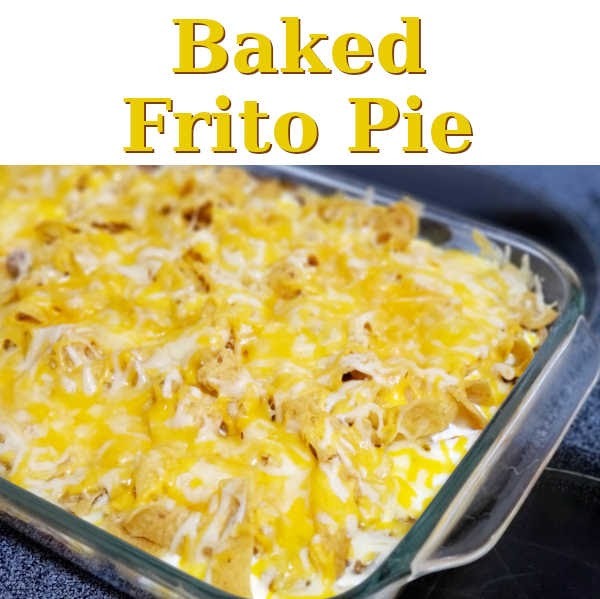 After 20 minutes take it out of the oven, spread thick layer of sour cream over the top then add another layer of Fritos and finally covered the entire thing with cheese. Pop the dish back in the oven for a few for minutes to let the cheese melt. Oh this sounds perfect for game day. I would love for you to join my weekly linky party, fri-monday come strut your stuff at Bacon Time. Mmmm that looks yummy ! @Heather@Simply Mommy It was delicious. @Mindie Hilton Thanks for the invite. I'll be sure to link up. I linked up some pretty tie dye cupcakes on my blog - you should come check them out! Oh yum! This sounds delicious. I haven't had frito pie in ages. Looks yummy! We had tacos last night. Thanks for sharing. Have a great day! This sounds delicious--I am going to take this recipe with me the next time I go grocery shopping! Thanks for sharing! Oh man this sounds good. And gluten free too! Thanks for sharing and happy SNS. @Joyce - Quilted Nest Yes, My daughter is allergic has celiac so most of our food is gluten free. Oh my gosh... thats sooooooooooo awesome!! looks yumm!! Yes! It was Yummy! thank you for your sweet comments. Wow! That's really looking smashing yummy!Thanks for sharing the recipe! @Reshma at colorcanopy.blogspot.com Any time. Thank you for your sweet comment. oh wow! Would love for you to come over and share this at my Tasty Tuesday Party going on now! Fritos - enough said! YUM!